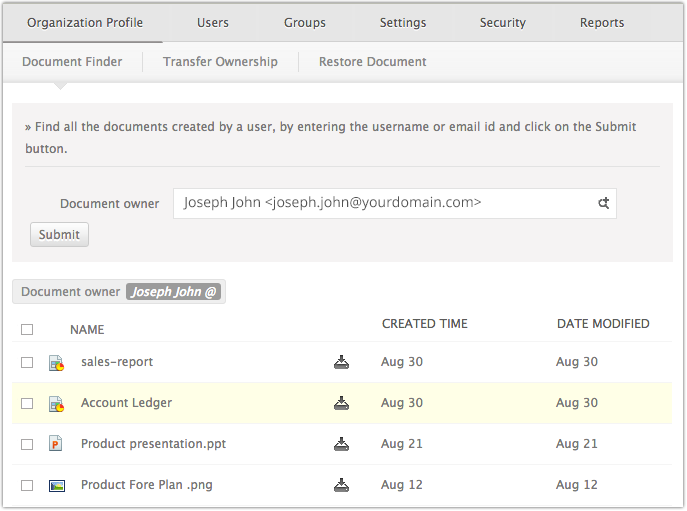 You can quickly search the documents owned by a particular person in your organization. You just have to enter the username and document finder lists all the documents created or uploaded by a person. Note*: This feature is available only with the Zoho Docs Premium Plan. To upgrade your plan click here. Click on the Settings icon on top right-hand side, next to your username. From the drop-down menu select the Admin Panel option. A new set up page will open in a new tab. Click Admin Governance tab on top of the page. A list of all the documents created by the user, for which he is the owner will be listed.